The team at Anthony Spink Dental Suite provides every solution that your family needs. With our spectrum of services, you can be confident that we’ll help you meet your goals. If you have considered getting braces but don’t like the idea of noticeable metal orthodontics, we can help you. 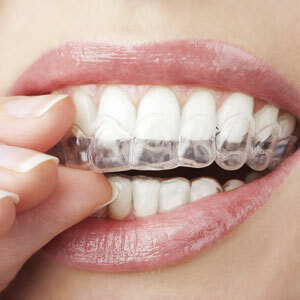 Invisalign is a world-renowned system used by millions of happy patients. Find out more about this system below! Nearly invisible. You can smile without anyone noticing that you’re straightening your teeth. Removable. You can eat meals or attend events without your aligners on. Comfortable. The SmartTrack® material the aligners are made from is flexible. Fewer doctor visits. You’ll only need to see us for checkups every 6-8 weeks, far less than with traditional braces. Clear timelines. You can see each stage of your treatment so that you know exactly what to expect. Improved oral health. You can remove your aligners to brush and floss, so you won’t have to worry about compromising the health of your teeth and gums. Overbite. Your upper from teeth overlap their lower front counterparts. Underbite. Your lower teeth cover your upper front teeth. Crossbite. With your mouth closed, some upper teeth are inside your lower teeth. Gapped teeth. You have extra space between two or more teeth. Open bite. Your upper and lower teeth don’t touch when you close your mouth. Crowded teeth. There isn’t enough space in your jaw to accommodate teeth, causing them to overlap, twist and bunch up. Small modifications. Maybe you have just a single tooth that isn’t quite right. If you want to make a minor correction, Invisalign can still be for you. We’ll see you for a consultation to determine if Invisalign Brighton is right for you. There are no messy moulds to take. Instead, we utilise the powerful technology of 3D scans and ClinCheck® software to fine-tune your treatment plan. You’ll be able to see the before and after pictures before embarking on treatment. Your series of aligners is custom-tailored in the Invisalign laboratory, then returned to our clinic. When you pick up your aligners, we’ll make sure they fit you as they should. You’ll get full instructions about when to switch them out for the next set. We’ll see you periodically for checkups to ensure the proper shifts are being made. With a smile that you’re proud of, you can be more self-confident and be the best version of yourself. Find out why Invisalign has been chosen by more than 5.5 million people who love their results. Contact the friendly team at Anthony Spink Dental Suite today to schedule your first consultation!